Pace Temple high-fives a coach as he exits the field during a game this season. Temple finished his Butler career as the program’s all-time leading receiver. Collegian file photo/Jimmy Lafakis. 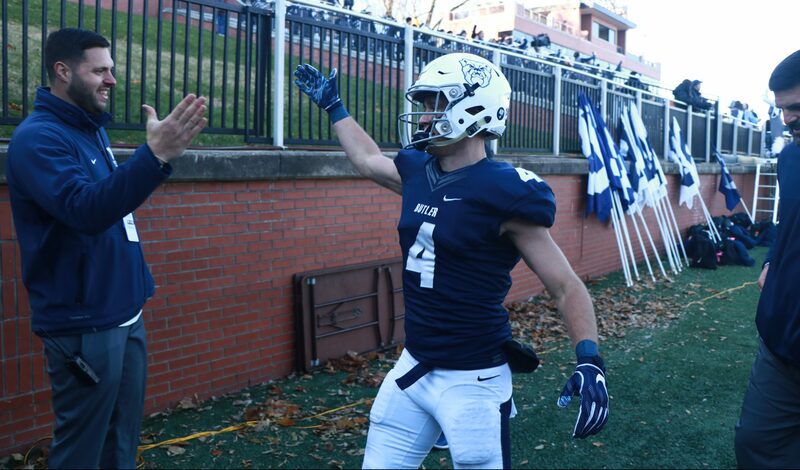 The relationship between Pace Temple and Butler football is like that of any other love story. Like Romeo and Juliet or Cinderella and Prince Charming, they’ve defied steep odds to be together. They need each other in a way that they need no one else. Before coming onto the field in his No. 4 Butler jersey every fall Saturday, Temple reminds himself what he’s doing there. But Temple was not supposed to end up here. Not at Butler. Head coach Jeff Voris recalled what he was told by Temple’s high school coaching staff. “Good luck. You’d be lucky to get him,” they said. In reality, they were right. Players of Temple’s caliber rarely end up in a place like the Pioneer Football League, a conference that doesn’t offer athletic scholarships. Even Voris didn’t initially like his odds. What Voris couldn’t get from watching tape was a sense of the personality that Temple brings to the field. Everyone that Voris spoke to at Geneva Community High School was enamored with him. Temple received scholarship offers from North Dakota and Wyoming, the latter of which would have seen Temple catch passes from Josh Allen, who would eventually go on to be the seventh overall pick in the 2018 NFL Draft. Wyoming plays at the FBS level and their stadium has a capacity of around 30,000 compared to Butler’s approximately 5,500. If Temple is Prince Charming, then scholarships, NFL quarterbacks and stadiums that could fit his entire hometown in it are the fancy women that try to chat him up at the ball. Sure, Temple likes them, but he hasn’t yet found his love. Until Cinderella comes along: Butler University. Teammate Will Marty recalls a story that he heard from Temple. Temple suffered an injury in high school that shed light on the harsh reality of sports. A career-ending injury can be just a play away at any time. So Temple decided that he wanted to not only play football at a competitive level, but get the best education that he could get as well. “Butler just fell in his lap, and it was just a really good, comfortable decision for him to make,” Marty said. Over the past four years, Temple and Butler football have grown even more comfortable together. They need each other. Temple is Butler’s all-time leading receiver with 3,364 career yards. He’s broken the program’s single-season receiving record twice in the past two seasons. He’s tied for the program record in all-time touchdown receptions, at 22. Aside from his production throughout the course of games, his late-game heroics have played a huge role in keeping the Bulldogs in several games this season alone. And, his impact goes beyond the field. “He’s one of those special guys that I think everyone saw him as our best player, but he never acted like a guy that was the best player,” Voris said. “He was the ultimate teammate. He was there for guys when they needed them, he not only inspired guys by the way he worked, but he helped other guys whenever he could”. He has been Butler’s best player for the last couple of years and is among the greatest in the history of the program. But the relationship is not one-sided. Temple needs the program and needs football as much as it needs him. Temple has been diagnosed with ADHD, a disorder that, among other things, causes a lack of focus. Since he was young, he’s had teachers yell at him for not being able to stand still. Football has been an outlet for him since he started playing it in middle school, but its significance has only gotten bigger as other outlets have been eliminated. Temple can’t find this anywhere else. Anyone can talk about how much they love something. But Temple showed it. As Marty recalls, Temple wouldn’t miss practice for anything. Whether it was a pulled groin muscle, a pulled hamstring or a bruised rib, he’d be ready to go the next day. And the team showed their appreciation back. Marty in particular noticed how much Temple put into the game and did everything he could to make sure he got just as much out of it. “He elevated my game because I wanted to play better for him,” Marty said. Because Temple has the opportunity to play at the next level, Marty saw it as a responsibility to help Temple accumulate stats and help him win. This was true during Temple’s final game with the Bulldogs against Davidson on Nov. 17. He had only one thing on his mind: winning. Down by 11 points with seven minutes to go, this didn’t change. Temple caught his ninth touchdown pass of the season to bring Butler to within a possession. After a successful onside kick, Butler needed a field goal to tie the game. A long third down put the game in jeopardy, but Temple’s 28-yard catch took the Bulldogs two yards from the endzone. After three unsuccessful rush attempts, Butler decided to go for the touchdown and the win. Junior running back Brad Sznajder fell inches short, Davidson’s entire bench rushed the field, leaving the remaining Bulldogs to maneuver their way through them to exit. Temple first embraced his teammates and then his parents. Tears made their way down his face. One of the last ones off the field, with eye black smeared down his face, Temple ran through the tunnel with one hand in the sky. Temple said he plans on continuing his football career wherever he can and for as long as he can. After that, he’ll likely look for a career in marketing and sales, an area that he has worked in as an intern with Adidas this fall. As Temple’s family has pointed out, Temple plays his best when he shows “childlike passion”. Temple’s not worried about losing that whenever it is that his football career ends. The clock has struck midnight, the magic spell is over. Temple will never put on a Butler uniform again. And Butler will never have another Pace Temple.